Home › FAQ › What are AP Classes? If your parents or teachers have suggested that you take AP classes, you might be wondering what AP classes are. To learn more about what they are and why you may want to consider taking them, read on. 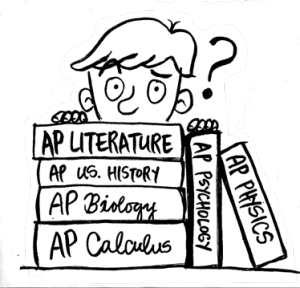 AP courses are normally taken during a student’s junior or senior year. Any AP classes that you take should count towards your high school graduation requirements. You’ll be graded the same way you are in your other classes, but the subject material will be harder. This is because AP classes are supposed to cover college-level material. At the end of the year, you’ll take a comprehensive proctored test. If you get a good score, you may able to get college credit. You won’t earn college credit if you do poorly, but your AP scores won’t affect your high school grades at all. All colleges in the U.S. know what AP classes are, and many offer credit for AP exams. Different schools may offer credit for different tests. For instance, one college may award you four credits if you pass the AP Biology exam, but another college may only give you three credits. Some schools award eight credits for good AP Biology scores. In order to get credit, you usually have to score at least a 3. Some colleges require a score of 4 for certain subjects. Even if the college that you’re planning on going to will accept a score of 3, try to get a higher score if you can. Many universities offer more credits for higher scores in certain subject areas. The credits that you earn from passing your AP tests can count towards your general education or major requirements. If you don’t need the credits, they can still count as electives. Taking AP courses can help you prepare for college and impress college admissions officers. Once you learn what AP classes are, you should seriously consider taking some if you want to be challenged in high school.